This is such a cool series! Great review! My sister showed me this series..didn't really take a second look at it but am definitely going to now!! Great review! 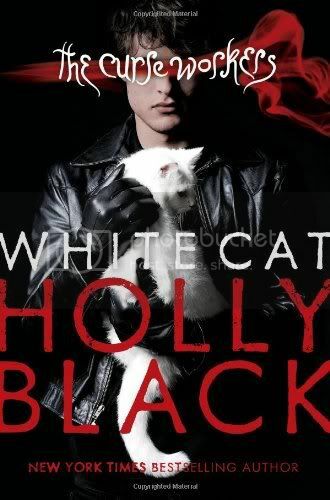 I absolutely LOVED White Cat!! I was actually surprised that I liked it so much, I was only reading it out of dedication to the author. It was amazing though. The world Holly has created is intense and creative. The plot twists kept me on my toes and the characters were wonderful too. I'm reading Red Glove right now (100 pages til I'm done!) and I can happily say that it's great so far! I just kind of skimmed your review, because I'm reading this book right now. The thing is - I'm having a hard time getting into it! I'm about 50 or so pages in, and I'm not finding that I want to dive back in when I have to put it down. I guess this just wasn't for me. I'm going to keep reading it though, and I have an ARC of Red Glove, so we'll see! I haven't read this one yet but it's definitely making it's way to my shelf soon! Sounds really interesting and not your usual paranormal concept...I love a fresh new take! @Honey- I'm really looking forward to starting Red Glove soon!! @Krystal- It does start to pick up later in the book. :) Let me know if you decide to finish it or not, I look forward to seeing what you think! Thanks for a fantastic review. I really want to read it, I'll have to find some time to though. I haven't read this one yet. I picked it up from the library about a last summer, but never got around to reading it. I think I might pick it up soon though! Glad you enjoyed it! I liked this book, but it took me until 3/4 of the way through to really get into it. I'm hoping that I'll be able to read WC right into Red Glove, and maybe that will help. I liked it, though, for sure! Yeah - I'm hoping that it will pick up, I've heard nothing but good things about it, and with all of the anticipation going around for Red Glove, I'm interested to finish and see what the hype is about. I loved this book too! Now I can't wait for Red Glove! Great review too.